I know, I know – I’ve sort of abandoned this blog for the past month or so. I’ve been in something of a funk recently, and despite the fact that we continue to cook really great food on a regular basis, and I’ve been keeping up with my assignments for Barefoot Bloggers, I just haven’t had the motivation to come here and sit down and spend the hours required to get any of it down on virtual paper. To tell the truth, I still am not feeling particularly motivated, but I’m trying to force myself through some of my self-imposed backlog in the hopes that once that source of stress is gone, I’ll be more interested in writing about the new stuff. To that end, I’m going to bend the BB rules a bit and post the last three challenges in this post, so I can start fresh with the second recipe for April. 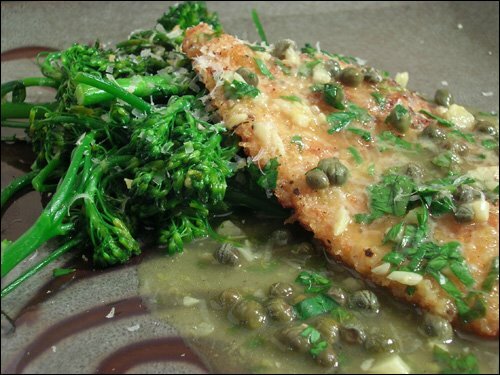 Chicken Picatta is definitely one of those classic dishes that I think every cook should know how to make, and though I’ve made it myself once or twice, I was usually guessing my way through it. I was thrilled when Lindsay of Noodle Nights and Muffin Mornings chose Ina’s recipe as one of the challenges for March, as I would finally have a recipe to follow from a cook I trust. I made only a few small changes to this recipe (and for once, halving it wasn’t one of them – I made the full recipe in the interest of having leftovers for lunch the next day). First, I used panko breadcrumbs that I seasoned myself in place of the seasoned Italian breadcrumbs Ina calls for. 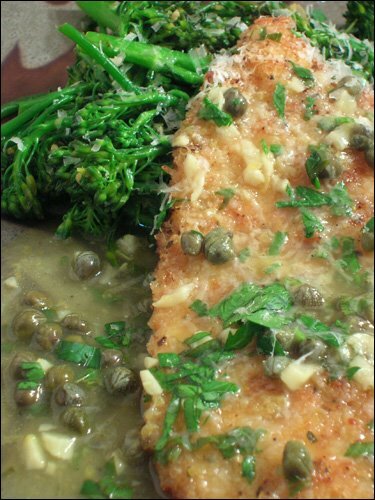 Second, I couldn’t quite see my way to making chicken picatta without capers, and I put garlic in everything, so when I saw that Ina’s recipe called for neither I knew that would have to change. I used a couple of tablespoons of brined capers and a couple of minced cloves of garlic and sauteed them in the pan before adding the stock, wine, and lemon juice. I also used just a tiny bit of cornstarch near the end to thicken up the sauce a bit, as I wanted it to sort of hold its own on top of the chicken rather than being immediately absorbed, as clear-liquid-based sauces are wont to do even when reduced. Finally, I topped our servings of chicken with a fine fresh grating of real parmiggiano reggiano, because everything deserves a little cheese. I also used this as an excuse to make one of the BRCs (Bonus Recipe Challenges) for March, Ina’s Sauteed Broccolini (technically I guess this was supposed to be February’s BRC, but whatever) as chosen by Mary of Meet Me in the Kitchen. Since the recipe called for garlic and lemon and I already had all that out for the chicken, it seemed like a perfect match. And indeed, it was. This was just about exactly what I expect when I think of chicken picatta. The chicken was toasty and crunchy on the outside while still being tender and moist inside, and the sauce was tangy, savory, briny, and bright from all the fresh parsley. 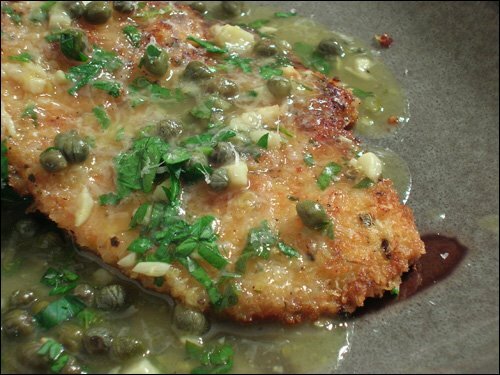 And I’ll say it again, I really can’t imagine this dish without capers, as the little pop of salty pungency you get when you bite into one with the chicken is just perfect. Love the vibrant gold and green colors of this dish. The broccolini was also a really great side for this, very clean and fresh-tasting, the simple preparation and seasoning allowing the flavor of the broccolini to really shine. I love broccolini though and cook it pretty frequently, and this is pretty much my usual method for cooking it – sometimes I roast instead of sautee, sometimes I use balsamic or soy instead of lemon juice, but the basic idea is the same – so I knew before I even made it that it would be good. I do feel like the meal as a whole could have used something a little bit neutral, like some whipped potatoes or bread, to help counteract the acidity from all that lemon, so next time I’ll probably add another side to help round things out. But overall, this meal was definitely a winner, and I can certainly see myself going back to these recipes. 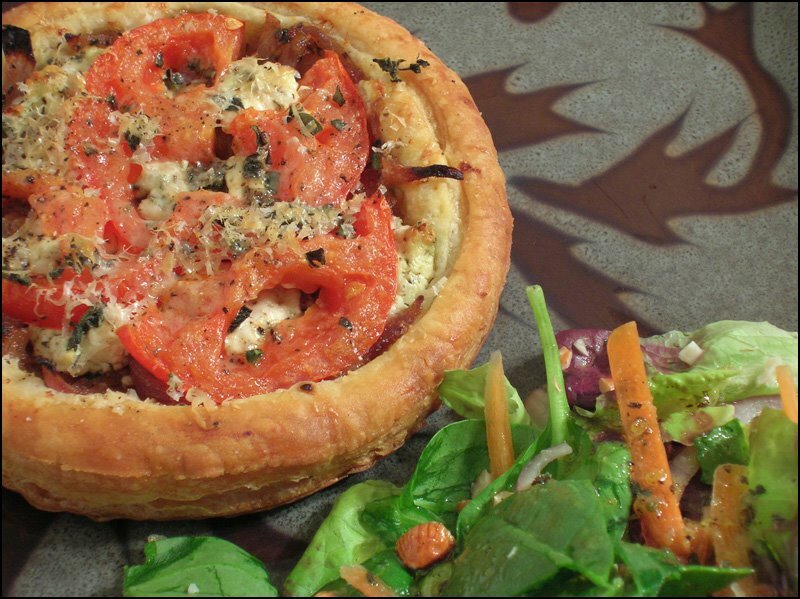 I just recently saw Ina make these Tomato and Goat Cheese Tarts on her show, and I remember thinking that it sounded extremely good. I was pretty happy when I saw that Anne of Anne Strawberry had picked this as one of our challenges, because I was sure it’d be tasty. 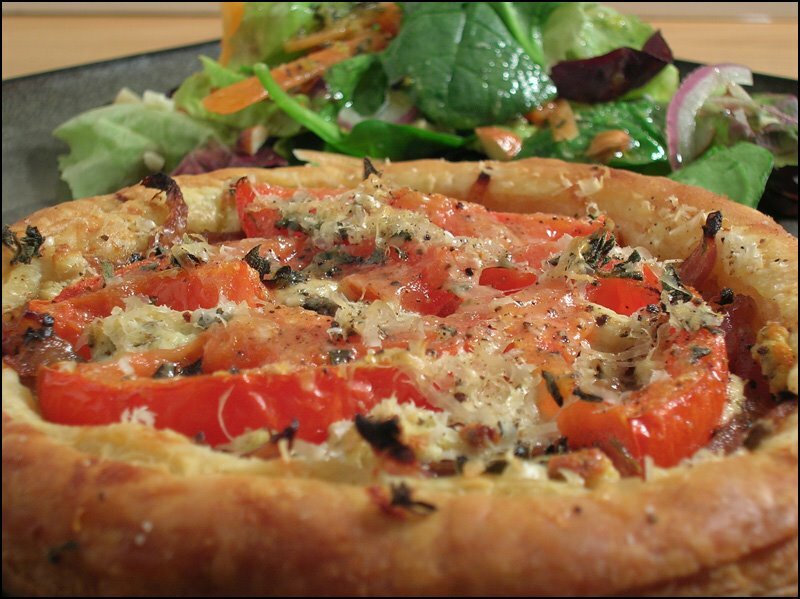 I had to make a few small changes to the recipe out of necessity, specifically because we neglected to buy either basil or thyme that week at the grocery store. I had dry basil that I could use as a substitute (not that dry basil is ever a good substitute for fresh) but didn’t even have dry thyme, so I had to improvise with some oregano and poultry seasoning. I couldn’t find garlic and herb goat cheese that didn’t cost an arm and a leg, so I bought fresh plain chevre and added seasonings myself (a grated garlic clove, some dry basil, oregano, and poultry seasoning, and some black pepper). 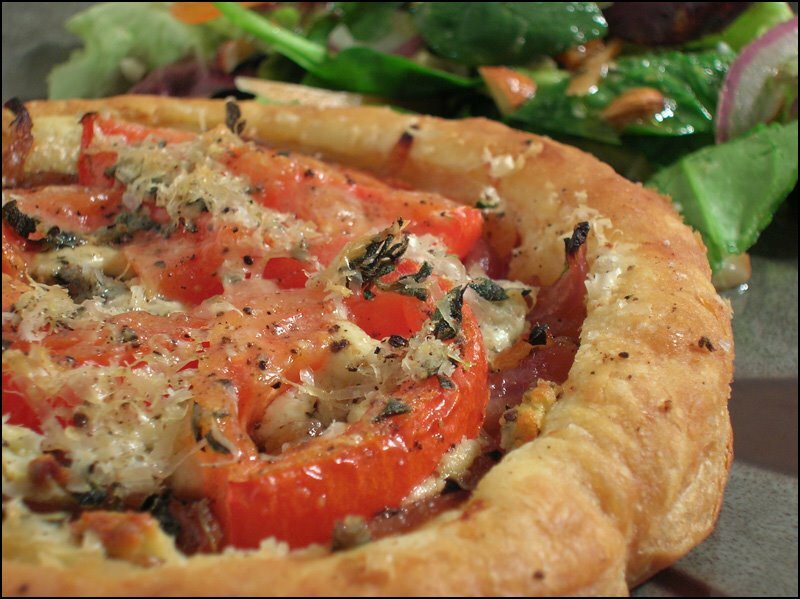 I couldn’t find a nice big tomato that looked like it’d be tasty to cut into big single slices, so I had to use a small vine-ripened tomato and use two slices per tart, halved and arranged as evenly as possible. Finally, I grated the parm instead of shaving it, which was really just an aesthetic change more than anything else. The tarts came out perfectly, they really did – I was actually really shocked that Ina’s technique for creating the tart shell worked as well as it did, and I think I will be using that technique quite a bit in the future – but I have to say, I was not thrilled with this. At all. And its not Ina’s fault. See, I used to love goat cheese, but last summer J and I had sort of a binge on it after visiting an incredible cheese shop in Mattituck and picking up the best chevre we’d ever tasted, a local product from Catapano farms. It was mild and creamy and incredibly fresh, and I think we ate goat cheese on bread every night for a week as an appetizer. But at the end of the week, after eating said goat cheese, later in the evening I wound up sick for some other as-yet-undetermined reason, and let me just say that no matter how good that cheese tasted on the way down, it was NOT pleasant on the way back up. I know, TMI, but I think you’ll all understand when I say that ever since then, my taste for goat cheese has waned somewhat. Its a shame, because recipes that call for it always SOUND so good, much like this one did. But I just couldn’t do it. I got through half my tart, and despite it being perfectly cooked with deliciously sweet caramelized onions, juicy tomato, and crisp pastry, that pungent goaty flavor just got in the way. So, unfortunately, the remainder of my tart went in the trash. Sorry Ina… its not you, its me. They sure look good, don't they? Wish I'd liked them more. J gave the tarts his seal of approval though, so that’s something. I’m thinking that if I ever made these again, I’d just make mine with feta – I KNOW I’d like that. This recipe was a surprise hit. 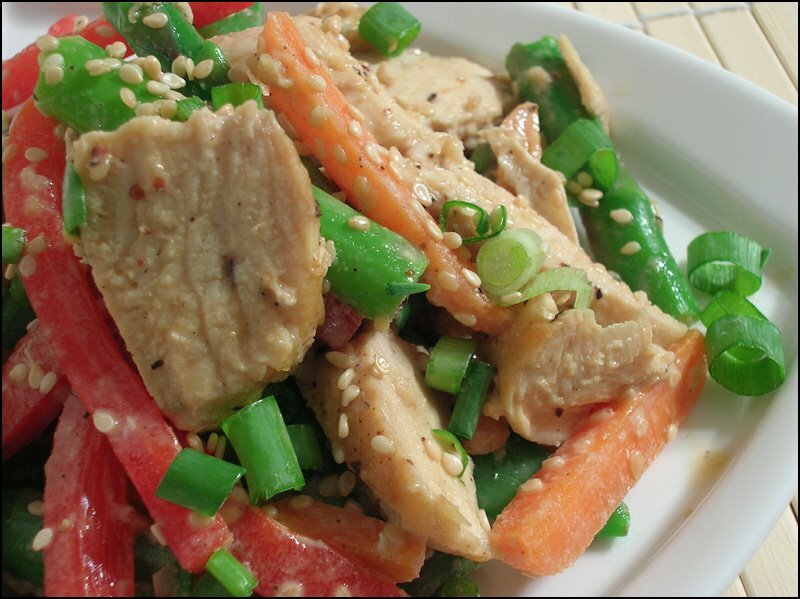 When I saw that McKenzie of Kenzie’s Kitchen had chosen this recipe for Chinese Chicken Salad, I was a little skeptical – my first thought was of that salad that people make with uncooked instant ramen noodles, which I happen to love but couldn’t imagine Ina making in a million years. When I saw the actual recipe, and how simple it was, I expected it to be ok, but not great. I must admit to being totally wrong. As usual, I made some changes here, but the biggest one was something I really had no choice over. I have a very severe peanut allergy, so the peanut butter-based dressing was definitely a no-go. Instead, I used tahini, as its texture and flavor seemed like the closest thing to peanut butter that I could safely use. (Am I the only one who always thinks that toasted sesame smells vaguely peanutty?) 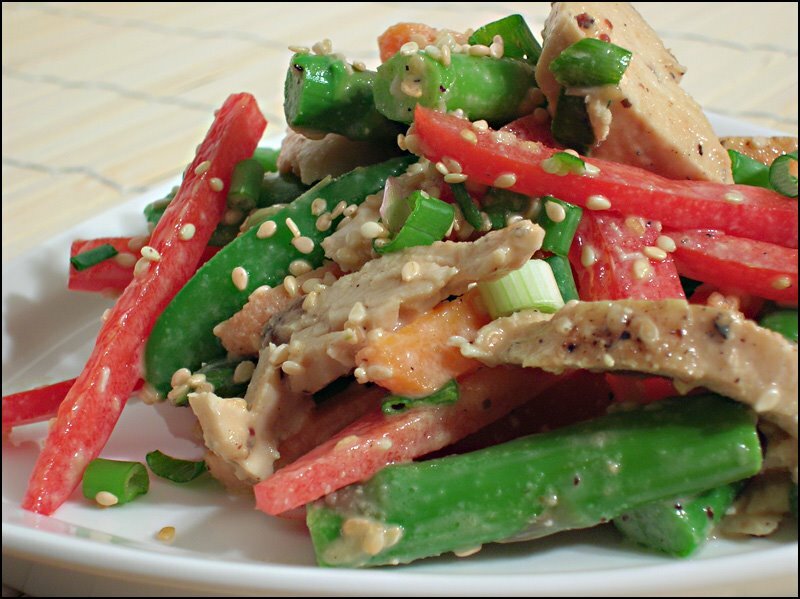 I also upped the veggie quotient by adding some sugar snap peas and baby carrots to the asparagus and red bell peppers that the recipe called for, making this even more springy and fresh. Finally, I made some small adjustments to the dressing itself to compensate for the tahini substitution and my own tastes, adding a bit more soy and using sugar in place of honey (which I didn’t have) and even a smidge of spicy dijon mustard for tang and body. Love how colorful this is. This salad was excellent – a great mix of flavors, colors and textures, supremely fresh and light while still managing to be completely satisfying all on its own. I was a hair’s breadth away from cooking up some soba to have with this, but it really didn’t need it. I had one noodle-bowl’s worth of the salad and was perfectly content and full, without feeling stuffed. We loved this, and I am certain we’ll be making it again when the weather gets warmer – I think this will be perfect picnic and bbq chow, just screaming to be eaten outside in the sunshine and fresh air, preferably with a cold beer or a glass of white wine. 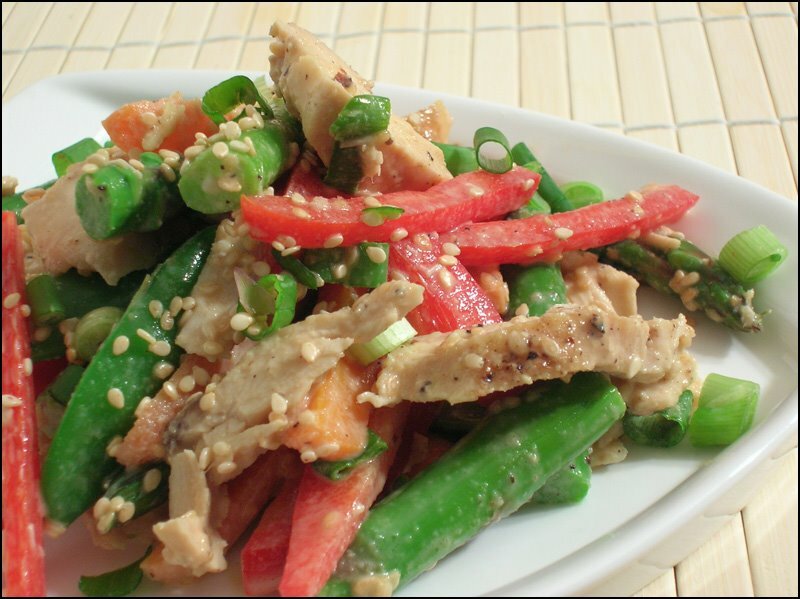 There aren't many things better than crisp veggies and tender chicken in a flavorful dressing. Even though I didn’t try it this time, I do think that this dressing would be perfect for a cold soba salad as well, so I’m pretty sure I’ll be trying that out at some point soon. PHEW. All caught up. I’ve got some other backlog to work through, along with another Ile de France cheese review (more goat cheese… ack! ), but then I promise to start posting new stuff again. I’ve got a great original soup recipe to share, and my first original cookie recipe, both from the past week. So stay tuned! This entry was posted in Food, Drinks and Cooking, Table for Two? Archives and tagged asian, barefoot bloggers, cheese/dairy, chicken, italian, pastry, salads, vegetables. Bookmark the permalink. great job getting all your BB posts in! i thought it was a little strange to see missing BB posts since you’ve made every recipe since you joined but it’s nice to see you’re back in the swing of things!